October, 17th,2014 - Sarasota City Manager Tom Barwin congratulated the Sarasota business community on Thursday (10/16) at the Greater Sarasota Chamber of Commerce monthly board meeting for winning Florida’s 2014 eCity “Digital Capital of America” award. Google recognizes the best cities in the country based on an algorithm representing the number of businesses advertising online, ability for customers to make purchases online, social media presence, and mobile friendly websites. 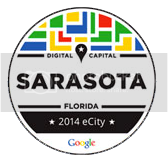 “Sarasota represents a growing trend of digital innovation. There are more and more companies implementing leading edge technology solutions for their businesses, and boostDFM is proud to be one of the leading agencies providing these services,” said Chris Laney, director of client experience for boostDFM. BoostDFM is a media and brand design firm based in Sarasota, Florida and located at the intersection of technology, content and interactivity. From web presence to brand design to custom programming including Augmented Reality (AR) and mobile apps, boostDFM’s philosophy of simple yet striking media design translates into respect, ROI and engaging client experiences across industries and across the nation. Visit www.boostdfm.com and find out how boostDFM will make the difference in your media.